Whilst the term 'Vikings' is used throughout these pages, it is a generic term used to mean anyone of Scandinavian descent. The word Viking has several meanings. The most usual being a 'pirate', and as such it could be equally well applied to any sea-going raider, even a Saxon, Frankish or Frisian one! Not that it was how the Vikings regarded themselves if you ever had the gall to ask. From the Norse, the term was used in the form of 'to go a-viking', making it sound more like a family day out. I suppose it depends on your point of view. The other common translation is 'a man of the bays or inlets' which comes from the name for the fjords in the area called 'Viks', and in this sense it is generally applied to the Scandinavians. The term Viking covers the Norse (Norwegians), Danes, Svear (Swedes), Rus (Russian Vikings), Anglo-Danes, Anglo-Norse, Hiberno-Norse, Icelanders, and Greenlanders. As there are such a wide variety of Vikings, many of the following articles only deal with them in very broad terms. 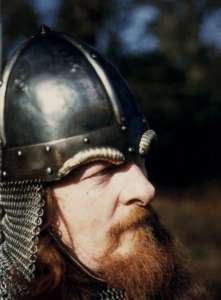 To confuse matters further, most Vikings would adopt many of the local customs, fashions and social structures of the areas they settled in, so for example, an Anglo-Dane would not look the same as, or act identically to a native Dane. With the naturalisation of Danes and Norwegians in Britain, came divided loyalties and aspirations. The main question should be as to why they bothered to risk a potentially dangerous crossing to get to Britain. Usually, it was put down to the large population expansion in Scandinavia at the end of a period called the Migration Period. As a result of a small amount of good farming land being available and the practice of sub-dividing land up amongst sons, the pressure was on to find new ways of earning a crust. This may or may not be the story behind the Viking forays overseas. But the simple fact was that after the Viking trading missions had visited your port, then there was potential threat of a more violent visit as they now knew where you lived, what was on offer and how well your port was defended. There is no reason why the Anglo-Saxons couldn't have gone raiding for themselves to Scandinavia, other than perhaps they were too busy making a good living over in Britain. Even the people who lived on the fringes of Scotland found little time or energy to bother returning to Norway, to give as good as they got. So perhaps that is the real reason, the chances of huge gains and slices of the cake far outweighed the risk. Farming seemed to be a very tiresome way to earn a living. To young men there was glamour in raiding, and they may not have been that strapped for cash either to begin with, as it has always cost a great deal to arm yourself, cover yourself in mail and put a helmet on your head. Their ships meant that they could pick and choose where and to a certain extent when to visit a settlement, with the advantage of surprise almost all on their side. There was no point in returning home from a long voyage with your equipment rusty, and little to show for your efforts, so that in turn meant that you had to be that little bit more persuasive when your raiding party asked for things of value. No wonder they got a reputation for being ruthless. 'Vikings!' - A brief look at some aspects of the Viking Age. 'Viking Social Organisation' - How Viking society was organised in Britain and western Scandinavia. 'Viking Military Organisation' - How the Vikings organised their military forces. Click here to return to the quayside. Last updated 10 December, 2002. Article by Roland Williamson 1999.